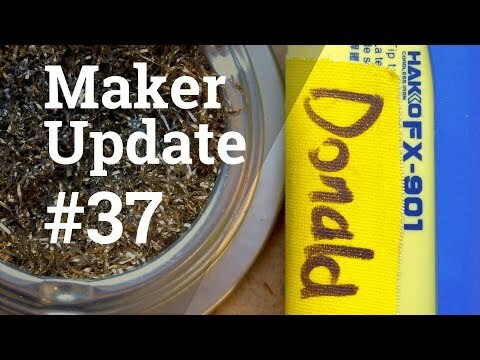 This week in Maker Update, a zoetrope and a fidget spinner make a baby, an SLS printer from Formlabs, a Raspberry Pi weather chamber, component carnage, and a tiny OLED Pi screen. Our featured Cool Tool is the Hakko FX-901 cordless soldering iron. This is the Hakko FX-901 portable soldering iron. It runs off 4 AA batteries that you can swap out really fast with this removable cartridge design. I use rechargeables in mine and I get over an hour of use out of it before I notice the temperature drops. Alkaline batteries will run hotter, but not last as long.